Tips for better use of the search box in Windows Explorer 7, 8.1 and Windows 10 for better Search Results under Windows! When you start the MS-Explorer [Windows-E], you can use the search box directly enter a keyword and start the file, or document search! 1.) ... Search file with a specific file extension in Windows. 2.) ... Search files with different file extensions. 3.) ... Looking for a specific file type. 4.) ... Search for a filename in example photos. 5.) ... Find a title in MP3 files. 1.) 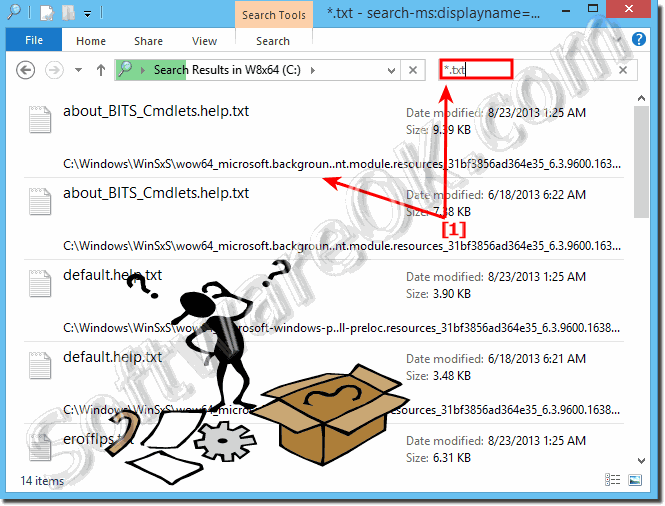 Search for a file with a specific file extension in Windows. If you are looking for just one specific file type! In this case, TXT files! Then just type *.txt in the Explorer search box! 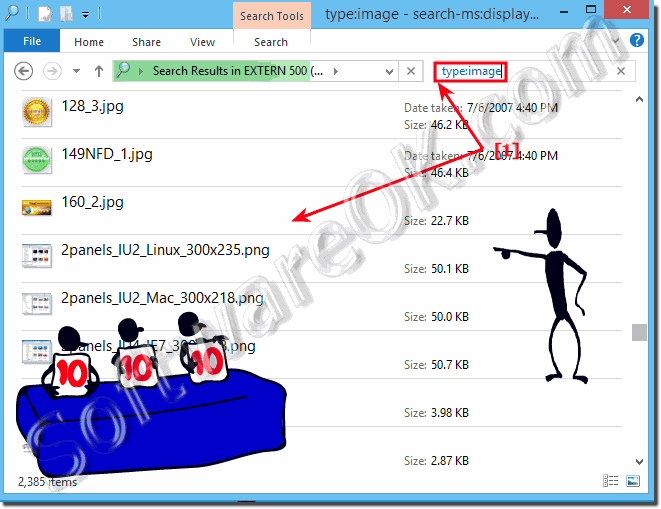 (Image-1) Search for a file via file extension! 2.) Search files with different file extensions. Here we look for files with extensions JPG and PNG! In the search box, you can use search key *.jpg OR *.png or Ext:.jp OR Ext:.png. 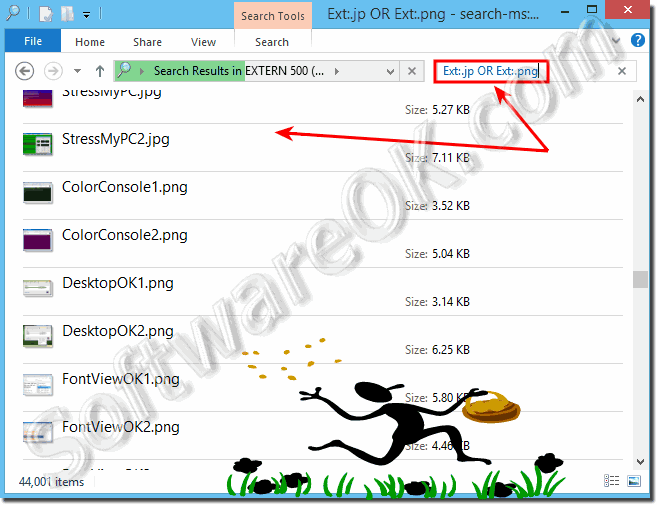 (Image-1) Search for different file extensions in the Windows Explorer! 3.) Looking for a specific file type. If, for example you want to search for any images, then enter in the search box type:image search text! 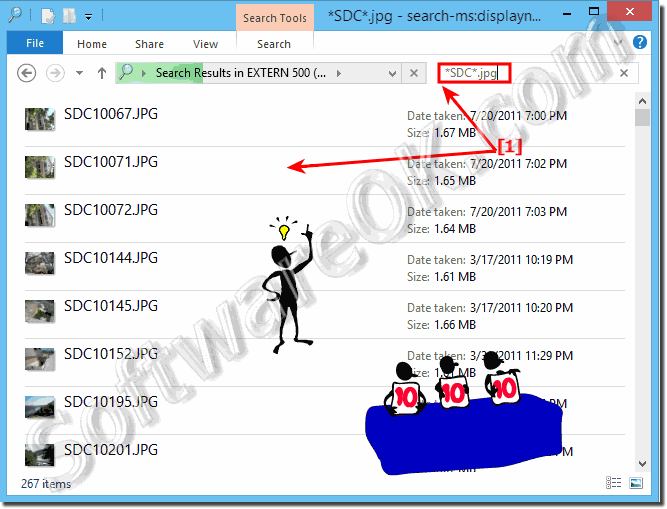 (Image-1) Search for a file type image via MS-Explorer file search! 4.) Search for a filename in example DIGI-CAM Photos. In this case we are looking for files from a digital camera! Because these digital camera saves the files with SDC, we give as a keyword *SDC*.jpg! (Image-1) Search for Images and Photos via MS-Explorer search box! 5.) Find a title in MP3 files. You are looking on a specific drive for MP3 files/songs titled madona. In this Windows search, we search for MP3's with an existing word "madona" in the title! 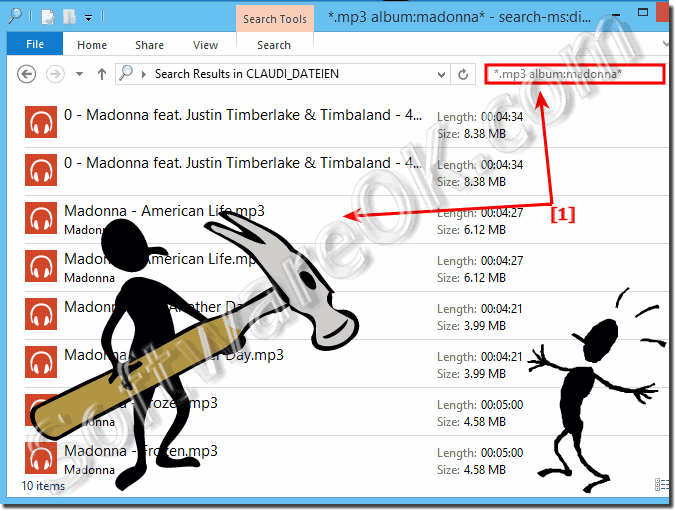 (Image-1) Find a title or album in MP3 files via search box in Explorer! Windows-8 - FAQ-194: How to use the search box in the Windows Explorer file search (8, 8.1 and 10)! File search box name Windows? File explorer search windows 8.1? Search box file explorer windows 8? Windows 8 explorer search box? Search box in windows explorer? At the search box type *.txt? Windows 8 how to search box?